Home Business Ideas Young Entrepreneur Revealed: The Secrets to Brilliant Business Cards! Revealed: The Secrets to Brilliant Business Cards! Too many business cards are ruined by the business owner trying to put too much on them. At the end of the day, you have to remember what these things are and what they do. They’re only small pieces of card, and they serve the simple purpose of providing people with your contact information. As a result, you don’t need to include too much on them or be over elaborate with style. Keep it simple and classy for the best results possible. Make it easy for people to see and read all the information on there too. Using black text on a dark blue background can be hard for someone to read, the same with a light color like yellow on a white background. Be smart and keep the style simple and easy for people to read. Regardless of how good the design is or how cool the colors are, your business cards can be ruined by poor printing. Too many small business owners try and cut costs by printing their own cards. You purchase card and use your home/business printer to do the work. Though this sounds easy, it rarely elicits professional results. You’re far better off looking for services like Vista Prints to finalize your designs for you. A professional printing job will make your cards look beautiful and extremely professional too. You can even make them glossy or add additional features to the card before it’s printed. By getting your business cards printed professionally, you ensure that a top-quality product is created and that they look how you imagined them too. The text and images will be clear and there will be no pixelation or blurry parts. I mentioned earlier how business cards serve the simple purpose of providing people with contact information. While this is true, there is also another secondary use for business cards. Think about it, these cards are a product produced by your company that will be seen by loads of different people. You will hand out your business cards to countless individuals and can place them in coffee shops or other retail stores. The bottom line is, you’re getting part your business out there to as many people as possible. What does this mean? It means you can start building brand awareness and recognition with your business cards. 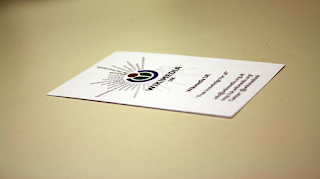 Consequently, the secret to a successful business card is to brand it and make sure it aligns with your company image. You must have a clear business logo on there that everyone’s eyes are drawn to. The colors you use must align with other color schemes you have – like the color scheme on your website or in your office. When people look at your business card they should be able to say it’s for your business before they even know who the card belongs to. These three things all combine to help create the best business cards possible. Consider all of these secrets if you’re looking to refresh your business with some new cards.